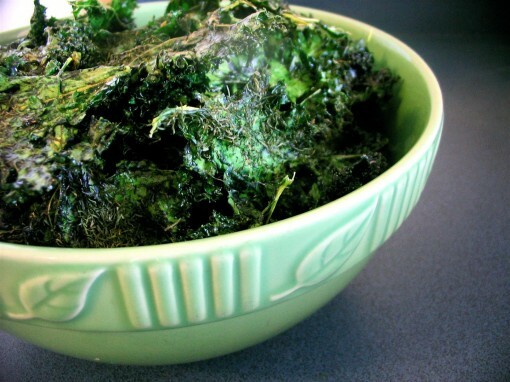 Dilly Dally Kale Chips was posted on August 22nd, 2013 and is filed under Dairy Free, Gluten Free, Kid Friendly, Low Carb, Recipes, Snacks, Vegan. This entry has 5 comments. You can follow any responses through the RSS 2.0 Comment Feed. I know that kale chips are now old news in the recipe world, but crazily, I haven’t done a post about it…and I’ve been making these “chips” for five years. Kale chips are perfect for when you get the mindless “munchies” and don’t want to break the calorie bank. It’s a great opportunity to STUFF yourself with nutrient rich greens without a hint of guilt! Kale chips are fun because you can get really creative. Use different spices or even cheese (definitely next on my list!) to get a rainbow of flavours…I’ve used used oregano to flavour them and that was lovely, but I think the dill and vinegar version topped them all. Wash and devein the kale leaves, tearing each leaf into palm-size pieces. Put the kale in a big bowl of salted (1 tsp. or more), cold water. Take the kale in your hands and squeeze it for about 30 seconds to bruise it. Drain water, but don’t rinse. Add the following ingredients (you can even let it marinate for an hour or two, to let some of the flavours sink in). Then, sprinkle generously with dried dill. Dehydrate until crispy. Believe me…you need to hide the dehydrator while it dries, otherwise, if you’re at all like me…at least half the trays will be completely gone. Don’t forget to get your daily colourful smoothie in! Want more colour in your day? Subscribe here to get all of my newest updates! Have you tried kale chips yet? Or made them yourself? You know I love kale chips, but surprisingly, I’ve never posted a recipe. Your recipe looks really good. I love experimenting with new kale chip flavors! I just wish I had a dehydrator to make them extra delicious and stop wasting all the energy in the world with my oven on low hah. Still haven’t tried kale chips! If in the oven, how long & how hot? I always end up burning them or having them underdone! Priya – Preheat an oven to 350 degrees F (175 degrees C). Line a non insulated cookie sheet with parchment paper and bake until the edges are brown, but not burnt. So like 10-15 minutes.